The two talented poets presenting WriteAngles October panel “Word Play” have each released new works of poetry this summer with a brand new press devoted to local writers. 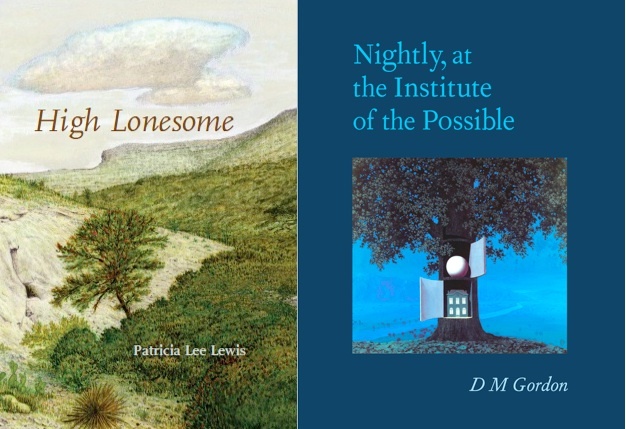 HIGH LONESOME by Patricia Lee Lewis of Westhampton, Massachusetts, and NIGHTLY, AT THE INSTITUTE OF THE POSSIBLE, by D M Gordon of Leeds, are inaugural books of poetry for Hedgerow Books, a new, independent press devoted to the literary voices of Western Massachusetts. From Jonathan Edwards in the early 18th century to Tracy Kidder, Ann Fadiman, and Richard Wilbur, award winning authors abound in the area and, among their neighbors, are many undiscovered gems. It is these new writers, yet unsung, that Hedgerow Books seeks to cultivate and promote. In fact, Hedgerow recently put out a call for new submissions. Each book offers its own particular gifts. NIGHTLY, AT THE INSTITUTE OF THE POSSIBLE lives in realms where imagination is the last frontier, but is grounded in earthly reality. HIGH LONESOME starts in the pastureland of west Texas and reaches into the collective unconscious. From the witness of buzzard chicks “their eyes luminous…their mouths lined with gold,” (Lewis), to the last flight of the phoenix, “the whistle of its tail–a feathered river jeweled with tangled wires and hooks,” (Gordon), these poems contain rare beauty and reach a reader’s emotional core.